Review of Mark Jantzen, Mennonite German Soldiers: Nation, Religion, and Family in the Prussian East, 1772-1880 (Notre Dame, IN: University of Notre Dame Press, 2010). Mark Jantzen’s study – titled Mennonite German Soldiers, which must sound oxymoronic to many – is a model of scrupulous, well-presented scholarship. Jantzen explains how the Prussian state succeeded over the course of a century in transforming a sect of pacifist peasants into self-conscious German nationalists. In ten chronological chapters, counting the introduction and conclusion, Jantzen demonstrates how this tortuous process was driven by “both ‘push’ and ‘pull’ factors” (p. 2). The heavy hand of the Prussian state imposed taxes for exemption from military service and at the same time restricted property ownership and other civil rights. Only the renunciation of a formal theological opposition to state-sponsored military service provided those Mennonites who remained in Germany after national unification (1871) full emancipation (p. 224). But the story, as Jantzen tells it, also sheds new light on the evolution of German nationalism and the peculiarities of German history. In that respect, his work will be as valuable, potentially, to historians of Germany as it is for students of Mennonite history. Jantzen begins his narrative with the first partition of Poland in 1772, which added the Vistula Valley including a population of roughly 10,000 Mennonites to the territory of royal or West Prussia (p. 20). Formerly under Polish suzerainty, the Vistula communities had sought privilege and exemption from a range of local lords. Under their new Prussian overlord, however, the Mennonites faced a centralized and more uniform policy, or set of policies. At least during the reign of the irreligious Frederick the Great (1740-1786), the Vistula Mennonites were spared the worst bigotry and were able to purchase their exemption from military service with annual collective contributions of 5000 Reichsthaler (p. 30). An additional restriction imposed for their pacifism was a limitation on the acquisition of property from non-Mennonites. Already at this stage, liberal Russian policies that promised more favorable conditions lured many to emigrate to territories further east (p. 42). The first comprehensive law, the so-called Prussian “Mennonite Edict,” was promulgated in 1789 and combined disparate regulations on exemption taxes, church taxes, and property ownership into a single policy (p. 55). This discriminatory law remained in effect until 1874. An elaboration of the 1789 edict issued in 1801 promised full emancipation for those who accepted military service. But those who continued to claim the exemption faced additional restrictions on property ownership: “only direct male descendants of current Mennonite property owners would be allowed to keep both their property and their exemption” (p. 69). 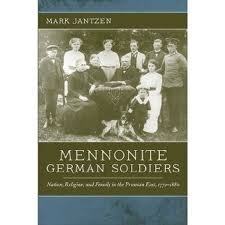 Jantzen tells us that this reflected the nadir of Prussian anti-Mennonite discrimination. The somewhat surprising result of the Napoleonic era and the Wars of Liberation was a more liberal policy towards Mennonite exceptionalism. Napoleon’s defeat of Prussia in 1806 ultimately increased militarization and an incipient German nationalism, and in 1814 Prussia introduced universal conscription. Yet soon after, in 1815, the state issued a secretive exemption – never published – that allowed Mennonites to continue to observe their pacifist beliefs. The effect of this relief was to reinforce the separate, estate-like status of the Mennonites – an odd development in the nineteenth century – and likewise strengthen their communities’ leaders, who continued to negotiate and represent their interests to the king and his ministers (pp. 93, 106). The political differences between liberal and conservative Germans in the half century leading up to national unification (1871) was mirrored increasingly among Mennonites. The character of this division within the Mennonite community was extremely curious, however, and counterintuitive, perhaps, for a twentieth-first century observer. German liberals supported equal rights (and obligations) for religious minorities, and were therefore staunch proponents of Jewish (and Mennonite) emancipation. But since full citizenship demanded military service, according to liberals, it should be expected of all regardless of creed. In contrast, German conservatives sought to maintain traditional estate differences and had no problem with the differential treatment of religious minorities. These philosophical differences, Jantzen explains, inclined the Mennonite traditionalists who clung to their pacifism to embrace the German conservatives, while those willing to accept conscription identified with and gave political support to the liberals. For this reason, Mennonite pacifists made common cause with German conservatives while those willing to surrender their pacifism followed the liberals (p. 159). Jantzen’s account of Mennonite acculturation also offers a valuable contribution to the broad historiography of German Central Europe. For one, the more traditional depiction of a German state riven between a monolithic Protestant majority and substantial Catholic minority is an oversimplification. Not only Germany’s tiny Jewish community but also the many smaller non-Catholic sects, such as the Mennonites, complicate the too-easy depiction of a tidy Catholic-Protestant division. Jantzen asserts that the Vistula Delta Mennonites “developed their own customized version of German national identity” by about 1880 (p. 6). A central issue in this process was the requirement of military service, a feature of citizenship and national identity that has been neglected, Jantzen suggests, in much of the literature on nationalism. As his analysis also illustrates, nationalism was never simply a state-sponsored project imposed from on high but rather a process in which individual actors and their communities participated in drawn-out negotiations with a range of cultural and state institutions (p. 9).